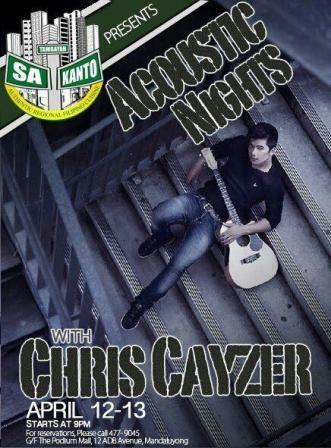 International heartthrob artist Chris Cayzer showed his acoustic side as he performed for the very first time in Tambayan sa Kanto restaurant cafe at the Podium, Ortigas, Pasig City. Dubbed as "Acoustic Nights with Chris Cayzer," the prince of rock and acoustic performed different love songs of different era. He sang a combination of love songs from the 80's, 90's, and from the current hits! Chris even amazed the audience as he perform his very own renditions of today's top hits like "Marry Me" of Bruno Mars, "Price Tag" of Jessy Jane, "Somebody That I Used to Know" of Gotye, and "Diamonds" of Rihanna. Chris shared three sets of music. Each set was composed of 10 songs which he performed solo! Yes, unlike in his previous gigs, Chris was a solo performer in the said night. The event took place on April 12-13, 2013, Friday and Saturday wherein the shows started at 9pm. Aside from Chris Cayzer's very inspiring performance, Tambayan sa Kanto also delighted the audience with their Eat-All-You Buffet. For only Php399, we can enjoy the foods offered by the resto and the songs from heartthrob!